I’ve made this dish twice. The first time, we ate it but didn’t quite enjoy it. After we had it the second time, the Wee One thanked me for cooking it. The next day, he ran out to my car after I pulled up in the driveway after work. He wanted to eat the left overs for dinner that night. 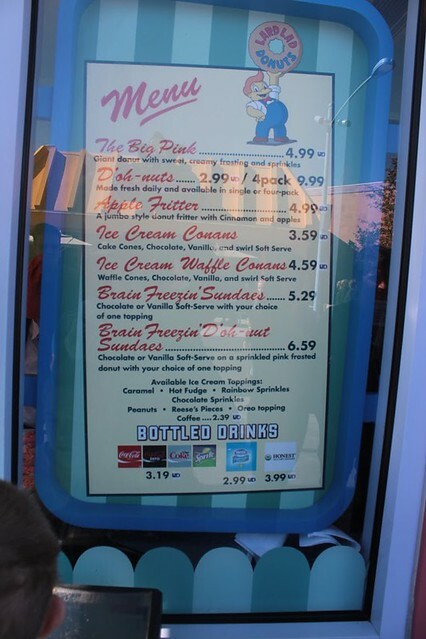 I’ve shared what ate on Day 1 and Day 2 of our visit to Universal Studios in Florida. 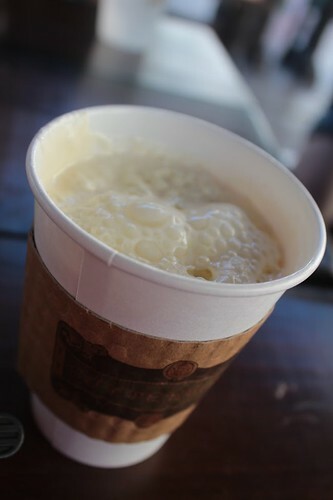 This Wednesday, I’m going to share what we ate on the third day of our visit to Universal Studios. We visited Islands of Adventure on that Tuesday. 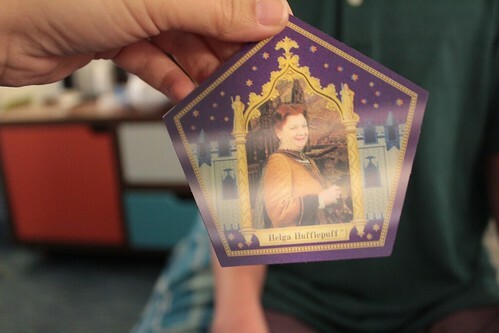 When we got to Islands of Adventure on that Tuesday morning, we darted over to the Hogsmeade area of the park. 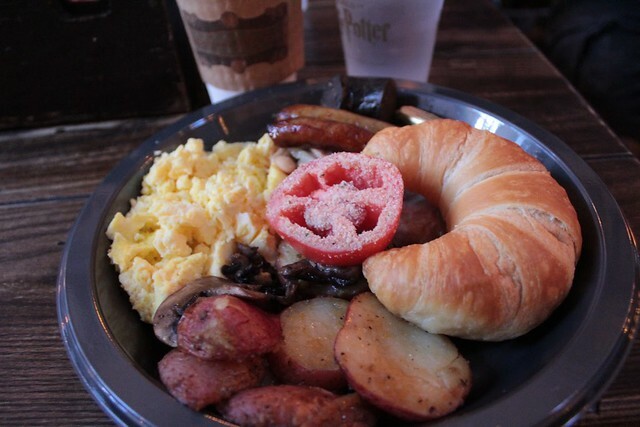 We rode the rides and then ate at the Three Broomsticks for our breakfast. 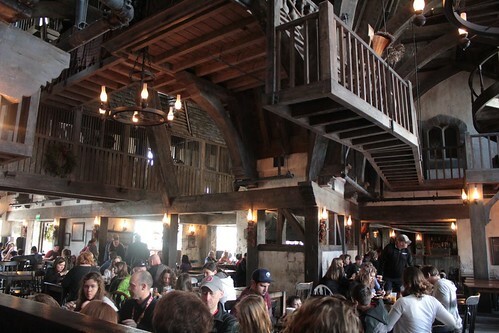 Inside the Three Broomsticks. 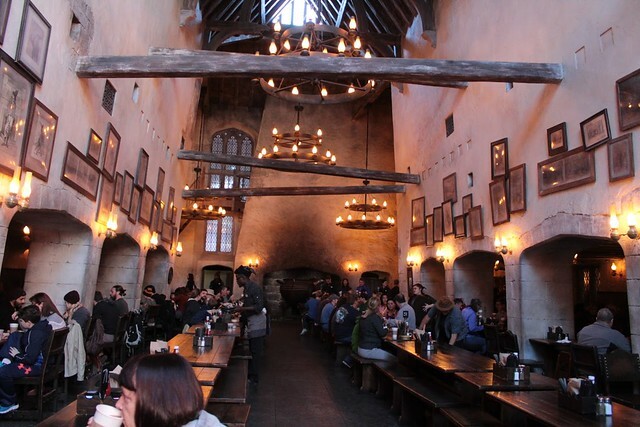 When we were at the Leaky Cauldron the day before, we were given a flag with a number. They sat us and brought us the food. 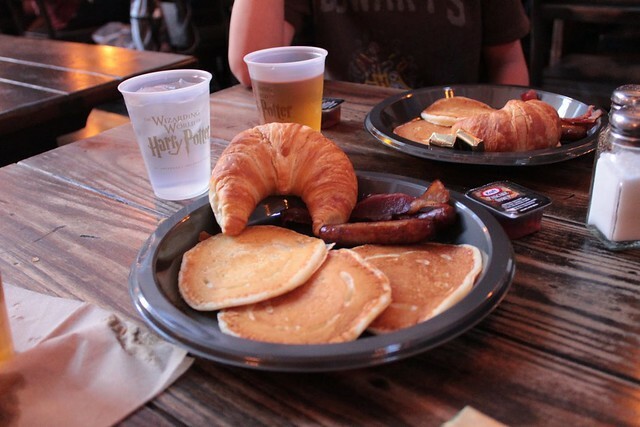 At the Three Broomsticks, we had to carry the food to our seats. 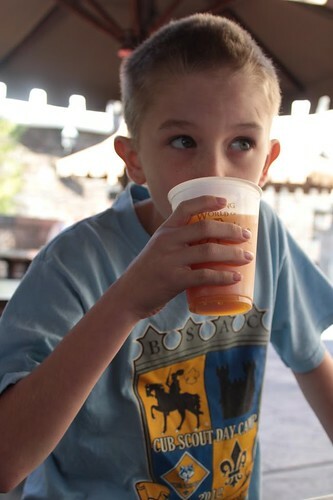 They had an outdoor seating area with a view of Hogswarts so we sat there instead of inside the restaurant. I got the traditional English breakfast once again. Hubby got his American breakfast and the boys got their pancake breakfast. I didn’t take photos of their breakfasts since they were the same as the day before. The Wee One decided to try pumpkin juice. YUM!! 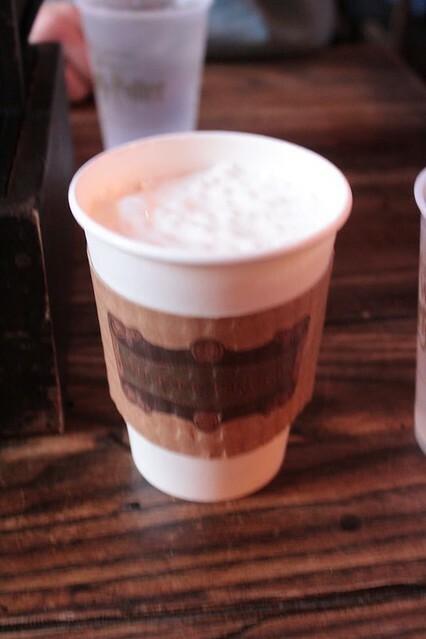 My hot Butterbeer – DELICIOUS! 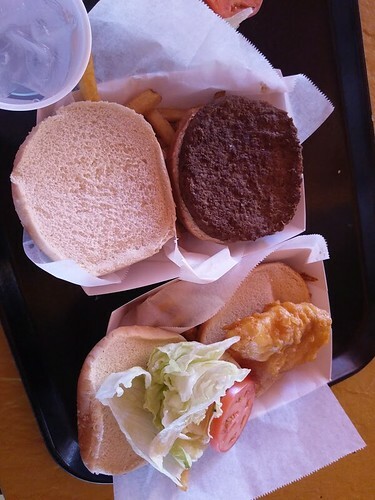 The hamburger and fish sandwiches we got at the Comic Strip Cafe in the Toon Lagoon area of Islands of Adventure. The Imaginative One had the hamburger and I had the fish sandwich. The fish sandwich was too dry so I don’t recommend it. Once we were done at Islands of Adventure, we went back to the resort so that the boys could swim. The day was perfect for swimming. Hubby and I decided to get a grown up drink from Atomic Tonic. 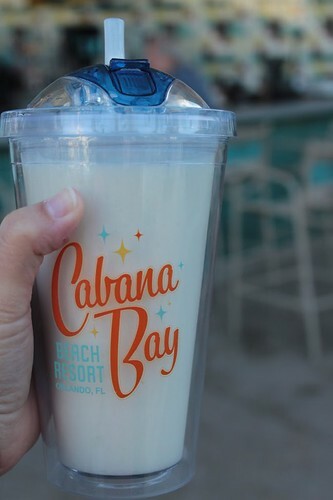 We got a key lime frozen drink that was absolutely YUMMY! 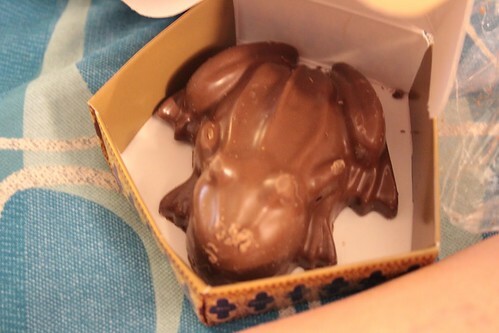 The chocolate frog we got at Honeydukes. The dinner we got at Bayliner Diner. The Imaginative One got a hot dog, I think. The Wee One got himself a kid’s cheese pizza. 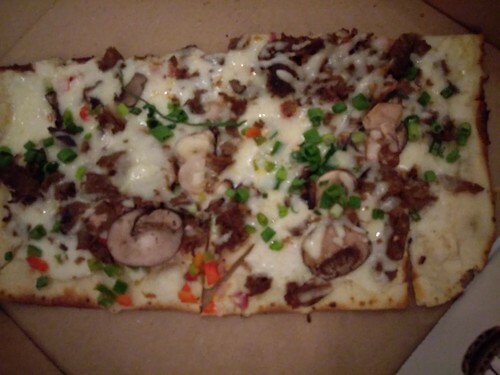 I got th delicious Philly Cheese steak flat bread for my dinner. It was so good. 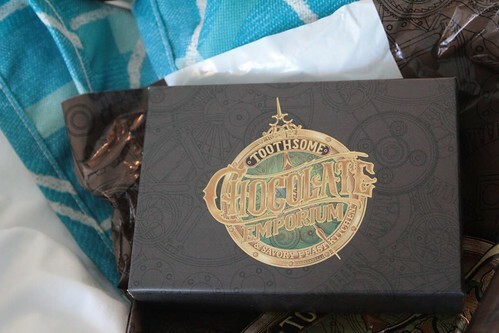 We went to the Toothsome Chocolate Emporium after we were done with Islands of Adventure. Hubby wanted some chocolate rocks from there. I got myself a macaroon and a box of chocolates. 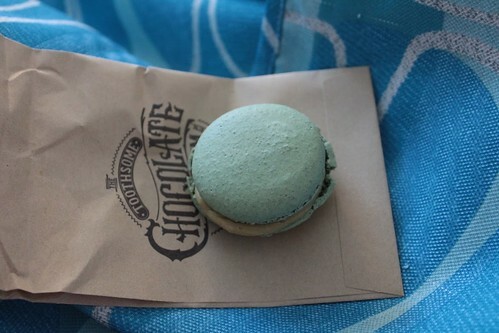 I ate the pistachio macaroon for breakfast the next day. 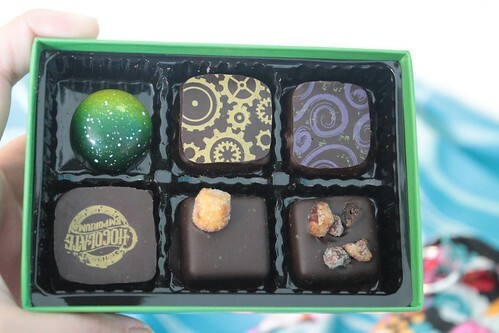 Four of the chocolates were eaten when we got home from the trip. I still have two more to indulge in. 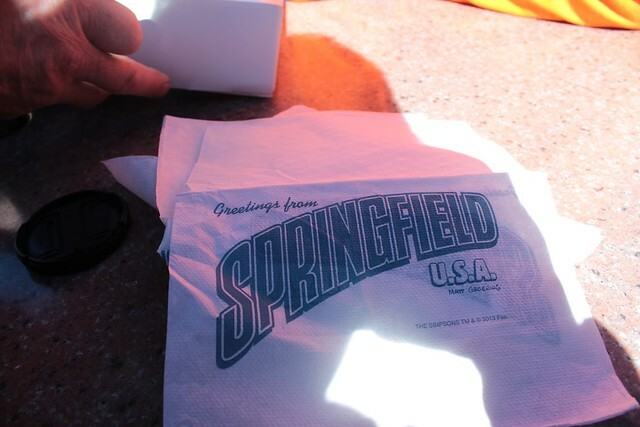 I hope you enjoyed what we ate while we were in Universal Studios. Welcome to our Tuesday recipe of the week. This week’s recipe if for pressure cooker chicken pot pie. My alarm jerks me out of sleep. Since I’m now awake, I curl up on the couch under my comforter. I either read a book, play on my phone, or try to catch up on my sleep. After a few hours, I’ll finally get up for the day. When I look outside, I’ll be grateful I don’t have to go anywhere. I’ll then grab my DSL-R camera so I can take some photos of the beautiful snow. I’ll either take photos from the front or back door so I do not have to get out of my pajama pants. Or if I feel up to it, I’ll get dressed in jeans and a sweatshirt. Okay let’s be honest, I won’t get out of my pajamas all day. 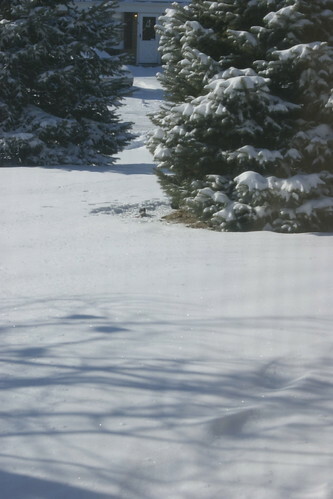 I’ll put on the coat and boots on over my pajamas so I can head outside to enjoy the silence of the snow falling and get photos of untouched snow. When I get back inside, the Wee One and the Imaginative One will be up for the day. Usually the Imaginative One does not want to go outside, however the Wee One will eventually want to go outside. He’s going to spend an half and hour playing hide and seek game with our hats, gloves, and boots so he can head outside for five minutes of fun. 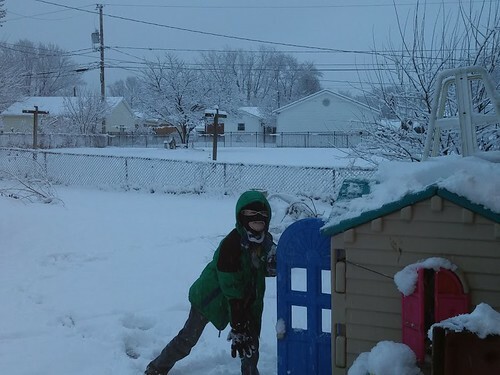 During his five minutes of fun, he throws snowballs at the house or trudges through the snow. Maybe he will sort of clean off my car. Once he is inside, he will drag snow throughout the house. Winter gear will be thrown throughout the living room, kitchen, and the hallway. Hubby and I will repeatedly remind him to clean up the wet floors. 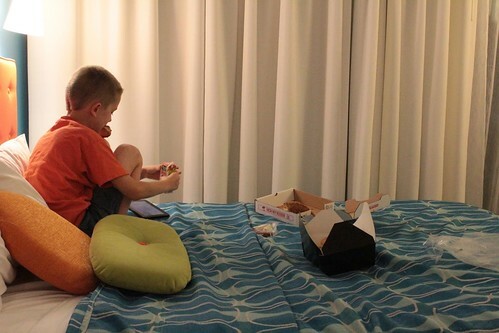 The boys will retreat to one of their bedrooms to play on their tablets. Or they might play on the computer. As long as their cabin fever does not cause them to become hyper or fight, I don’t mind them on the electronics. Since I’m home, I may make a special lunch or dinner. The rest of the day is rinse and repeat until it’s bedtime. 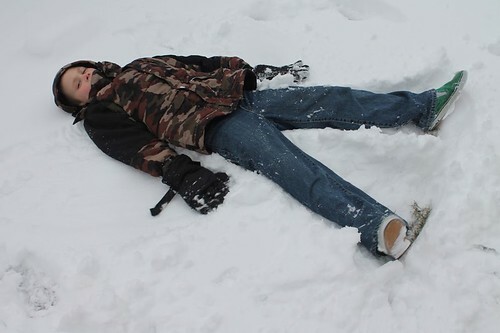 If there is another snow day the next day, we might go crazy in the house. 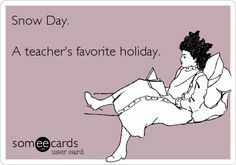 One snow day allows the teachers to recharge our batteries. Two or more snow days causes cabin fever. In November, we traveled to Orlando, Florida. 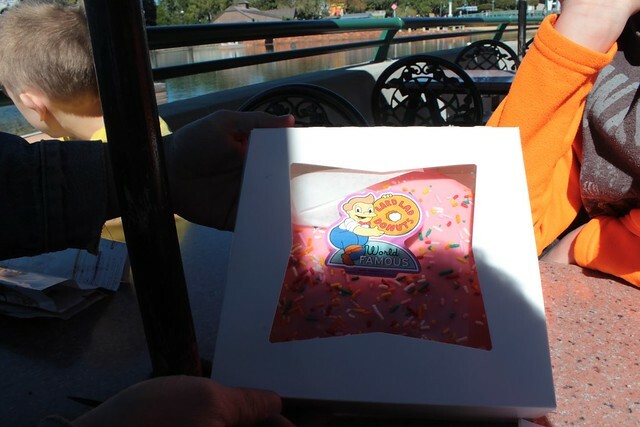 We visited Universal Studios and the Walt Disney World resort. 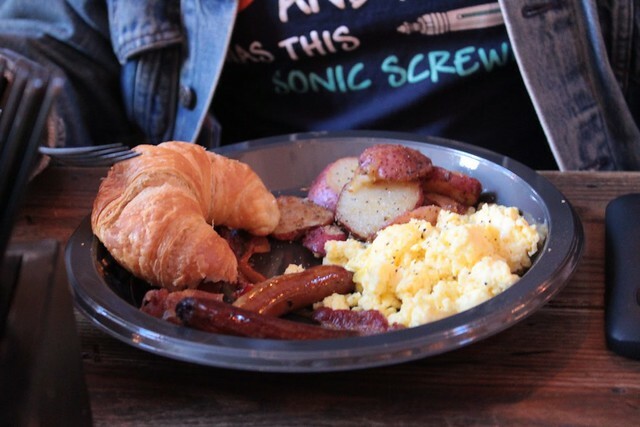 I’m sharing what we ate at both places. 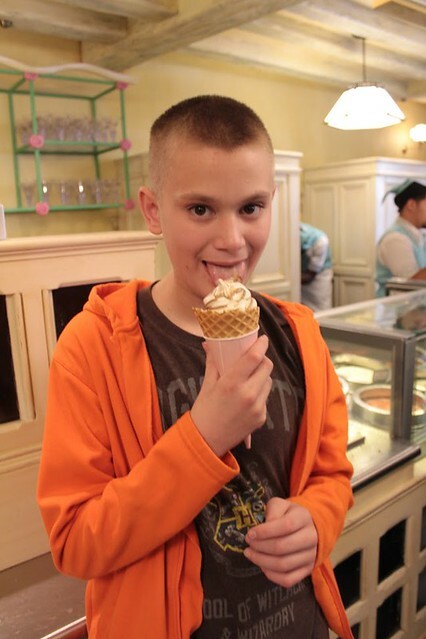 Please check out my travel page for the other What We Ate blog posts. The boys’ pancake breakfasts. The Wee One did not finish his plate so his 13 year old brother finished his plate for him. 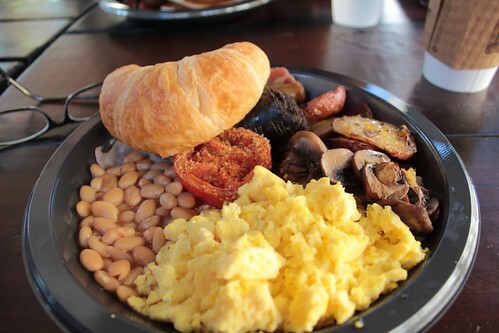 My traditional British breakfast – I tried the blood pudding but did not like it. We spent the day in Universal Studios. 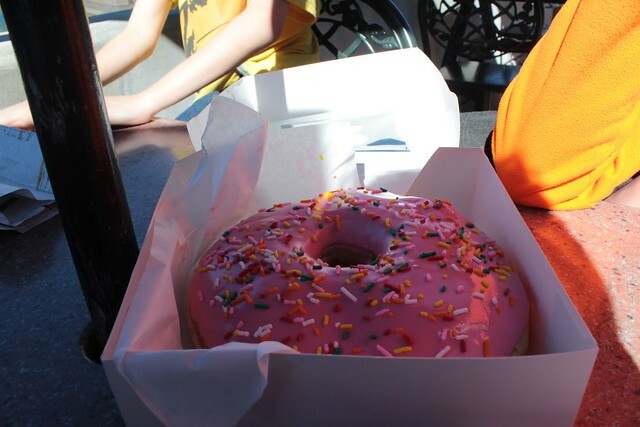 I had heard about the huge pink doughnut that you could get in the Simpson’s area of Universal. 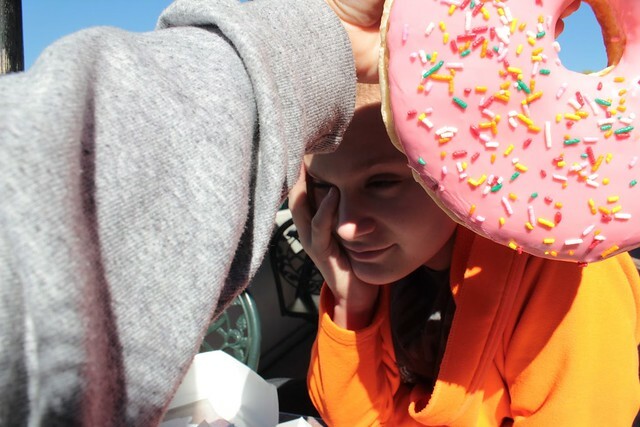 The doughnut was as big as his head. 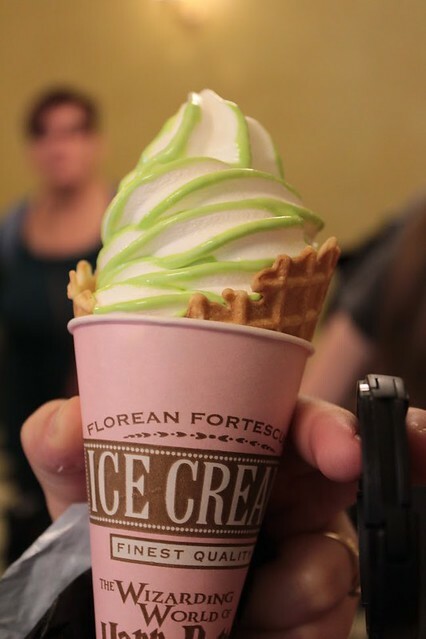 The ice cream from Florean Fortescue’s Ice Cream Parlor – I got the apple flavor. 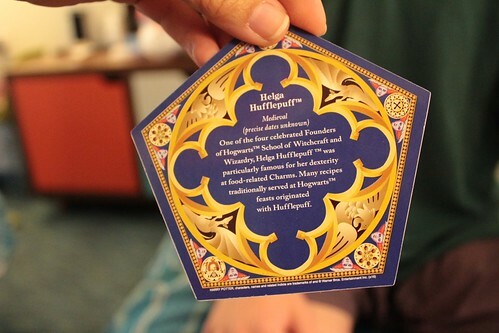 The Imaginative One got the chocolate swirl one. We ended up at City Walk for lunch. We decided to go see Fantastical Beasts and Where to Find Them while in Universal Studios. 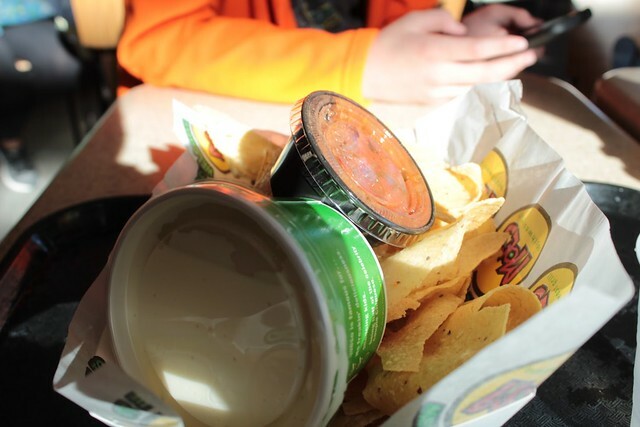 I got chips and queso from Moe’s. 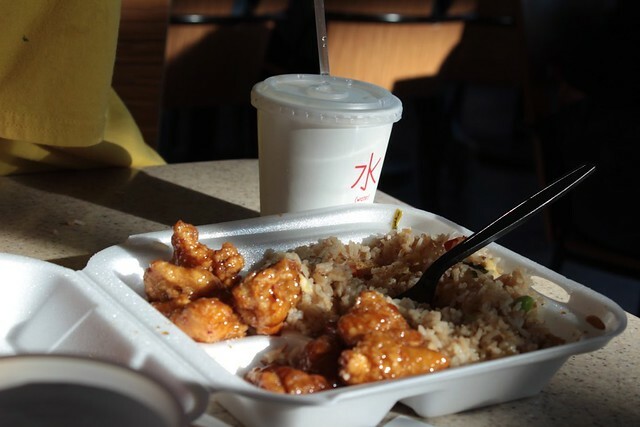 Hubby and the Wee One shared Chinese from Panda Express. The Imaginative One had Burger King for his lunch. Once again, we had cereal, oatmeal, and Oatmeal Creme pies for breakfast. I tried to make Taco Soup in the slow cooker for our dinner. However when we got back to the room, the slow cooker was unplugged off. So we did not have that for dinner. Hubby, the Wee One, and I shared a pizza for dinner. I don’t know what the Imaginative One ate for dinner. I’m going to try to post a new recipe every Tuesday. At least that is my goal. Let’s hope I can reach the target. It all depends on what happens in my life. As you know life happens. This week I’m actually on top of my game with our menu. Yeah! On Saturday, I cooked up raw hamburger in my slow cooker so that I could have already cooked hamburger meat for the week. For other menu plans, visit I’m an Organizing Junkie’s Menu Plan Monday.